Wet Film Thickness Gauges are designed to quickly and easily measure the thickness of coatings immediately after they have been applied to a substrate. These gauges are also commonly known as: Combs, MIL Gauges, Step Gauges and Notched Gauges. The gauges incorporate a series of notches cut into their sides much like the teeth on a comb. The wet film thickness of most organic coatings including paints, resins, lacquers, varnishes, gel coat, etc. may be measured. The thickness of powder type coatings may also be measured before curing. Teeth or notches are machined into the sides of the gauge. The teeth or notches on each side of the gauge are referenced to each other. For a given side, the two outside teeth or notches are the same size and are actually a zero reference datum which represents the substrate. All the other teeth or notches on the same side are of shorter lengths than the outside teeth or notches and represent different distances from the outside edge zero datum teeth. These different distances represent the surface of the wet coating thickness to be measured. The teeth or notches are graduated in MILS (0.001"). See drawing below. Place the wet film thickness gauge at ninety degrees to the coated substrate and penetrate the surface of the coating with the notched or toothed side of the gauge until the substrate is firmly contacted. 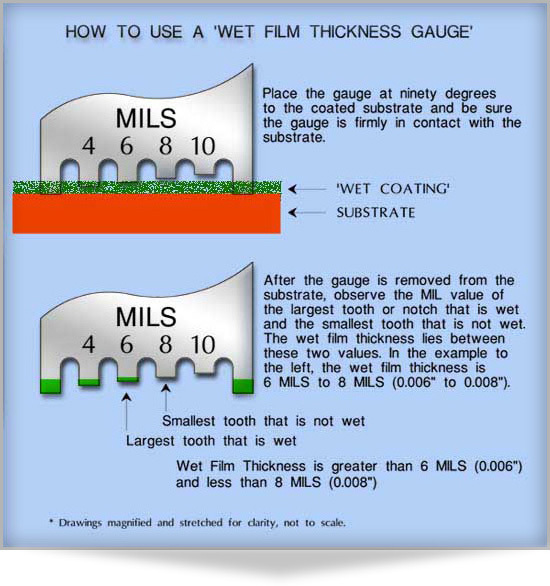 Wait several seconds to allow the teeth or notches of the gauge to become 'wetted' by the coating, then withdraw the gauge vertically keeping it at ninety degrees to the substrate. 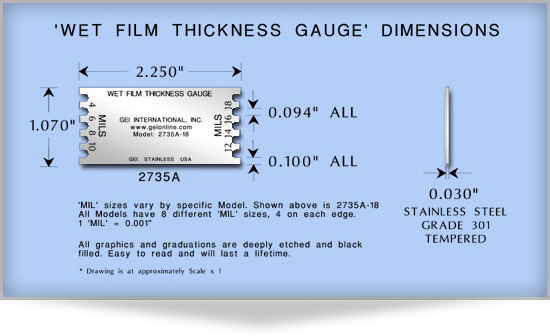 The gauge may now be read to determine the wet film thickness. The ends of the teeth or notches are visually examined, some will be coated or 'wet' and some will not be coated or 'wet'. 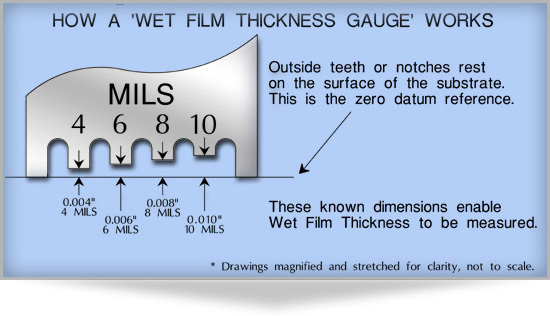 The wet film thickness (WFT) of the coating lies between the values of the smallest un-coated (dry) tooth or notch and the largest coated (wet) tooth or notch. Be sure to clean the gauge with an appropriate solvent after use. When wet film thickness is measured with the gauges on rough substrates, the thickness measurements made will most likely be from the surface 'peaks' and the wet film thickness measurement will represent the minimum overall wet film thickness. On curved surfaces such as pipes, cylinders, etc., the gauges should be used along the length of the curved surface or longitudinal axis. If quick drying coatings are to be measured, quickly perform your measurements to avoid errors that may be caused by curing. The thickness of dry powder coatings may also be measured with these type of gauges. The mode of operation is similar to measuring 'wet' coatings. The teeth or notches of the gauge should be 'dragged' at ninety degrees through the coating and the thickness of the powder will lie between the values of the smallest tooth or notch that has powder 'clinging' to it and the largest tooth or notch that has no powder 'clinging' from it. The substrate surface may also be examined for 'drag' marks left by the teeth or notches to confirm the values read from the notches or teeth. A 'drag' mark would indicate that the tooth or notch should have coating 'clinging' to it. The gauges are precision manufactured from hardened grade 301 stainless steel. All markings and graphics are etched and black filled. These gauges will survive harsh use, the graphics will not rub off (even sanding the gauge will not remove the graphics, numbers, etc.). These gauges are not designed as 'throw-away' items and should not be compared to gauges that are 'printed' or silk-screened. The overall size of the gauges is 2.25" x 1.070" x 0.030" (57.15mm x 27.18mm x .76mm). Each gauge has eight different measurement notches. See dimensional drawing below. VIEW FORMULAS FOR WET & DRY FILM THICKNESS, COVERAGE, ETC. East Syracuse, NY 13057 U.S.A.